We recently showed in a poll results post that only 26% would buy a Yahoo Directory link. If you lost a DMOZ link, would it have a major impact on your rankings? 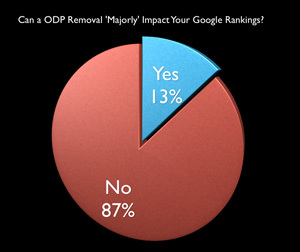 87% of the almost 300 responses say no, it won't have a major impact on their Google rankings. Only 13% said it would have a major impact on their Google rankings.